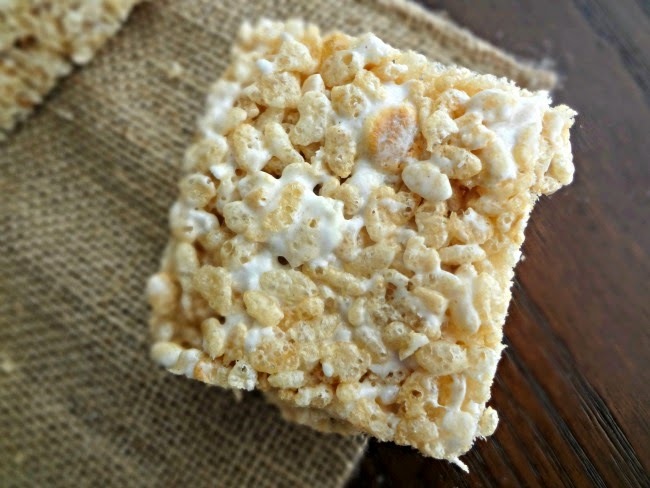 When it comes to Rice Krispie Treats....I'm usually a purist. Those recipes that put chocolate, peanut butter, etc. etc. in a krispie treat? Nope. Not for me. I prefer them the old fashioned way. 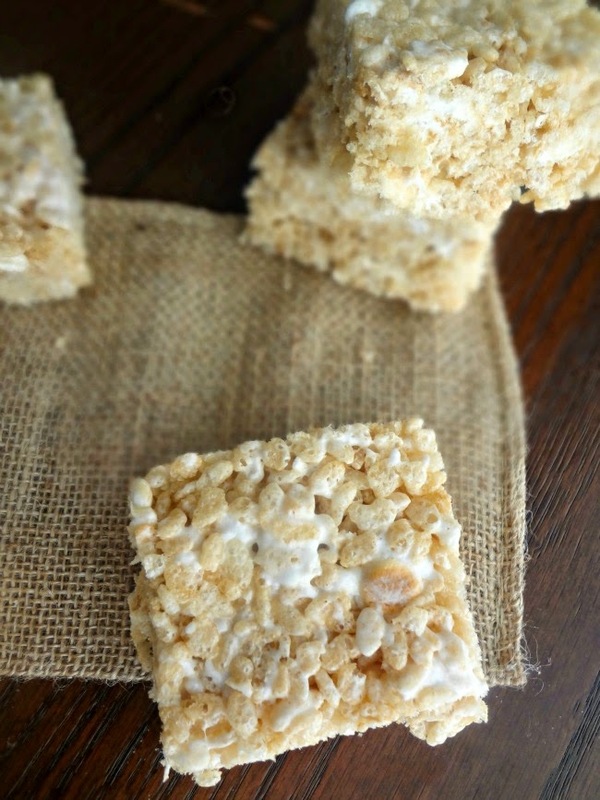 However....when I saw that you could brown the butter and toast the marshmallows...I figured...it's like all the same stuff you put in a classic rice krispie treat....but elevated. Taken to another level. Made epic to the nth degree! 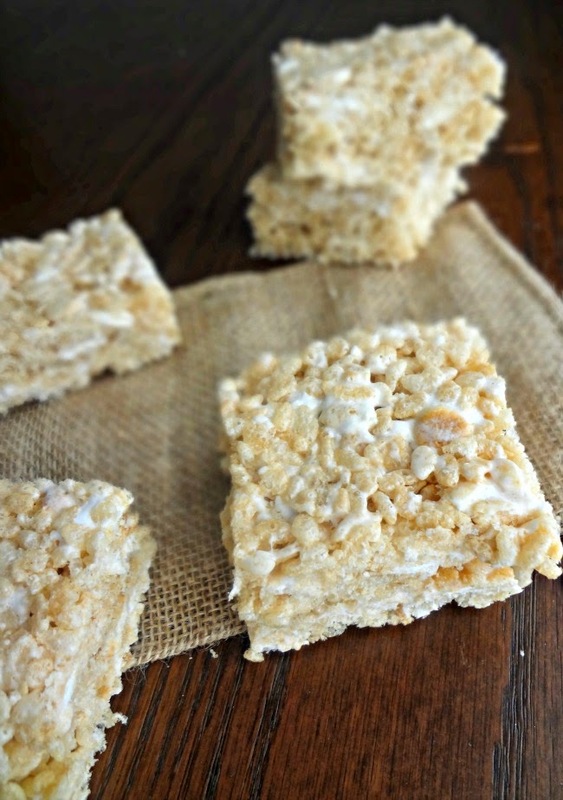 Rice Krispie treats were one of the things that my mom made best growing up. I can still smell the marshmallow and butter, I can still see her with a greased up ziploc bag on her hand (so she could smooth the treats in the pan), I can still taste them all gooey and perfect. Sometimes, if I was feeling impatient for her to make some, I would buy those pre-made rice krispie treats...but....they never tasted right. So I would spread a little butter on top, drizzle them with a bit of vanilla extract, and heat them up for a few seconds in the microwave. For some reason that made them a bit better. Weird. But now I'm a grown up and can make my own treats. So I did. 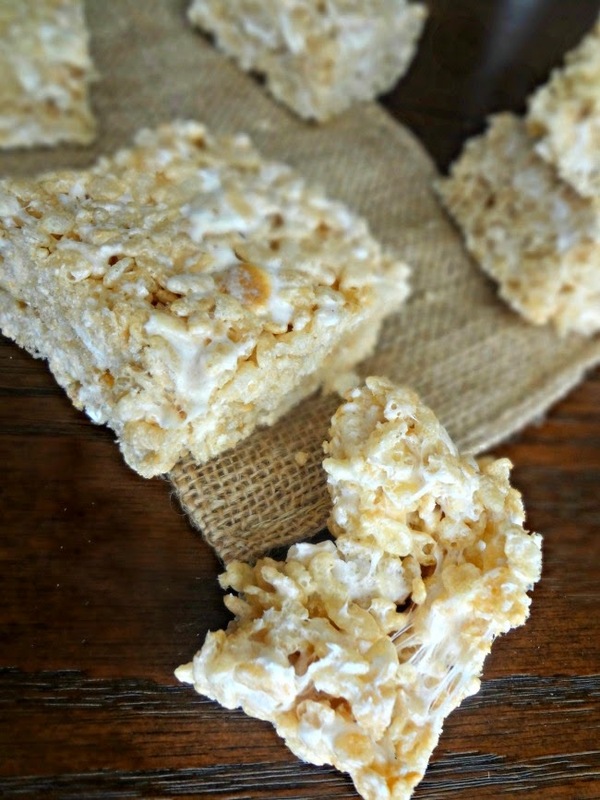 You know...you may think rice krispie treats are just something you eat. The end. Buuuut-not true! They make great gifts (they're sturdy so they travel well), you can use them for chocolate fondue, serve them with/in hot chocolate, or...ok...just eat them. I like them when they're gooey so I like to reheat leftovers in a microwave for 5-10 seconds...it just makes them a little bit extra special. 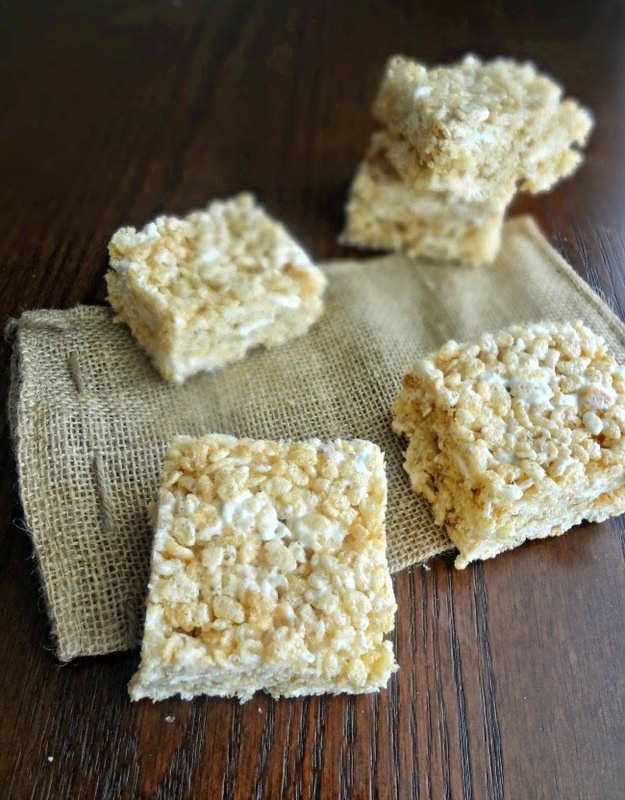 Speaking of extra special-these krispie treats taste pretty standard. But the differences are such wonderful bits of subtle nuance....the browned butter you occasionally will get hit with when you take a bite and it's extra buttery and a bit nutty. The toasted marshmallows give you that campfire/s'moresy little twist, just giving these an extra bit of oomph. Yeah. I think this is just how we should make Rice Krispie treats from now on. Makes one 9"x9" or 7"x11" pan. Grease a 9"x9" or 7"x11" pan with butter. To brown the butter: In a small (preferably light colored) saucepan melt butter over medium heat. Whisk constantly as it foams, bubbles, and brown bits form. Immediately transfer to a large, heatproof, bowl or pot. Line a rimmed baking sheet with parchment paper. Spread marshmallows into a single layer (or as best you can) onto the lined sheet. Turn over to broil and place the marshmallows under the broiler until puffed and golden. This should happen quickly so keep a close eye to avoid burning. Coat a rubber spatula with nonstick cooking spray and scrape toasted marshmallows into the browned butter. Stir, quickly, to combine. Pour the cereal into the marshmallow/butter mixture. Stir to combine. Tip-place ziploc bags on your hands and coat with nonstick cooking spray. Use your hands to make sure the mixture is evenly combined. Press evenly into prepared pan (again you can use the greased bags on your hands to evenly press and smooth the mixture). Allow to cool and then cut into squares and serve. Store leftovers in an airtight container (or just cover tightly with plastic wrap) for up to 3 days. I love the glimpses you get of toasty marshmallows!